Yesterday it snowed in Tasmania… but of course the season here is early summer. However, the tradition of Snow Music is now (actually this minute) being broadcast by ABC Australia, presented by charming Miyuki Jokiranta – whose Japanese name indeed translates into „beautiful snow“. Dinah Birds audio mail art piece „A Box of 78s“ forms the first part of this Soundproof show, the snow flakes come to you in its second half. 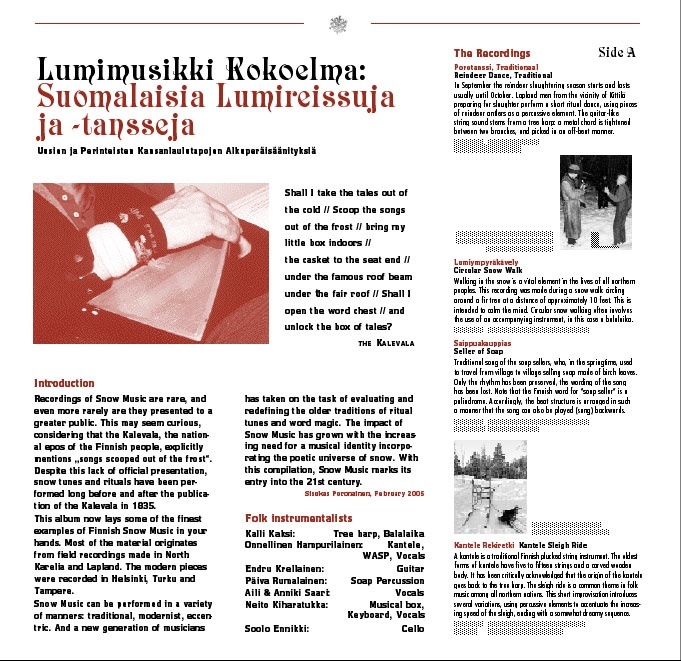 And just in case you find that you need a showy snowy real vinyl record for the European winter: Number of still existing records has melted down to 80… so hurry if you still want a copy of these adventurous recordings of „Finnish Snow walks and Dances“!